Camden Council is to experiment with a new traffic system along the east-west cycle route linking Fitzrovia, Bloomsbury and Kings Cross to address concerns about motor traffic volume and road safety, before starting work on its major West End Project. Torrington Place. Camden wants to reduce westbound motor vehicle traffic. Councillor Phil Jones, cabinet member for transport, is due to sign off a decision this Wednesday that will allow a 12-month trial of the changes. 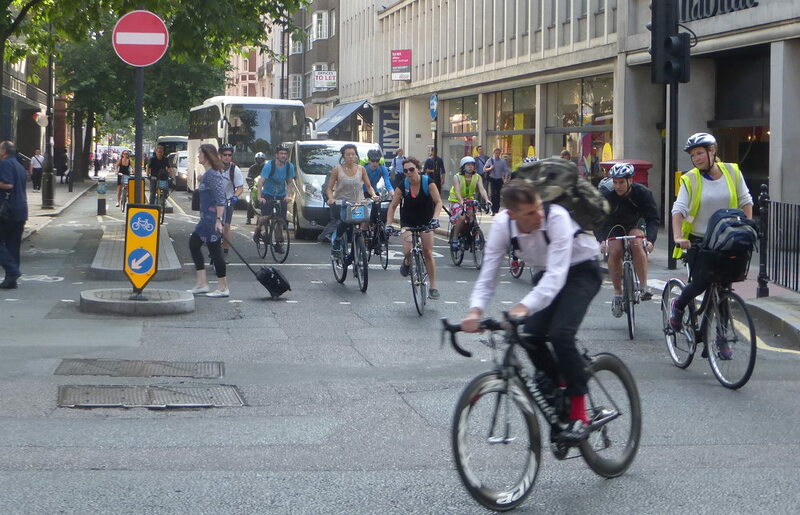 Jones said the trial “will reallocate road space from cars to cycling”. During its West End Project consultation Camden was severely criticised by residents groups in Fitzrovia because of the predicted increase in westbound traffic caused by changes to Tottenham Court Road. 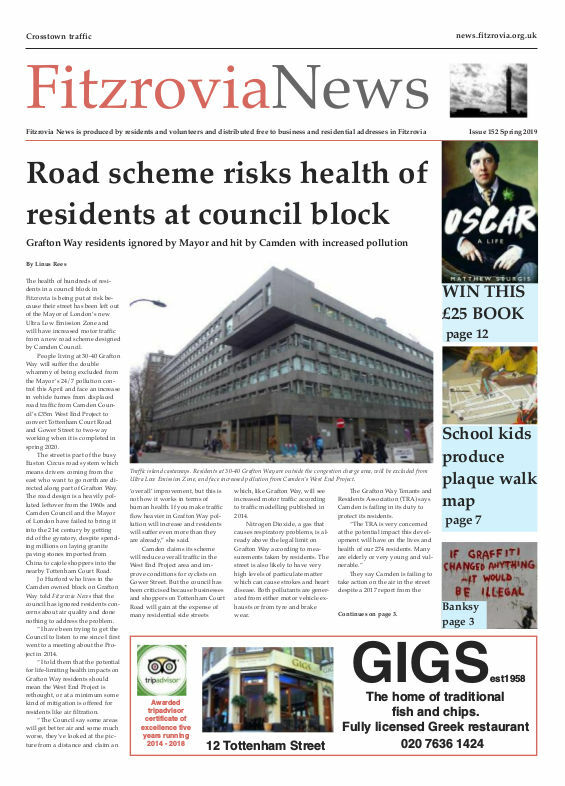 Concerns centred on the projected doubling of motor traffic in Torrington Place because of restrictions on private vehicles and taxis on Tottenham Court Road after completion of Camden’s West End Project. Experimental traffic changes from August 2015. Tavistock Place will become eastbound only for motor traffic and an additional cycle track will run along the south side of the route. The trial, which would start this August will aim to remove much of westbound traffic and address these local concerns about Torrington Place. It will also include a trial westbound cycle lane with a temporary segregation barrier running along the southern side of Torrington Place, Byng Place and Tavistock Place, with the existing northside segregated track becoming one-way eastbound. This would double the current capacity of the cycle route. The route forms part of an important east-west cycle link connecting Fitzrovia, Bloomsbury, Kings Cross and Angel. The existing segregated cycle lane on the northern side of the street was one of the first to be installed in the UK and has helped to significantly increase cycling levels on the street, leading to huge queues of cyclists forming along it. The latest surveys recorded 1,009 cyclists during the morning peak hour and 880 in the afternoon peak. “These figures demonstrate that the corridor is the busiest street for cycling in Camden and one of the highest in London and the UK,” says Camden. But the council is also concerned about the route’s safety record. “In the last three years to November 2014 there were 64 casualties,” says the report to the cabinet member. “Around half of the collisions were between motor vehicles and cyclists, and these resulted in five serious injuries and 21 slight injuries to cyclists. Nearly one-third of all cycling casualties took place at the Gordon Square (west) junction, which is one of only two locations where motor vehicles are allowed to turn across the cycle track from the main corridor. “Collisions between motor vehicles and pedestrians resulted in 18 slight injuries and six serious injuries to pedestrians. Over sixty percent of the casualties involving pedestrians occurred at two junctions: Upper Woburn Place and Marchmont Street (the latter junction was improved in 2012 to address pedestrian and cycling casualties). The majority of pedestrian collisions are due to pedestrians stepping out into the road in front of vehicles,” says the report. Pedestrians have also complained that crossing the cycle track and then two traffic lanes can be difficult and confusing. Camden says there is strong support for the introduction of separate protected cycle lanes on each side of the street. The proposed trial would be introduced using an Experimental Traffic Order which would be advertised in the local press in the same way as a permanent Traffic Order. 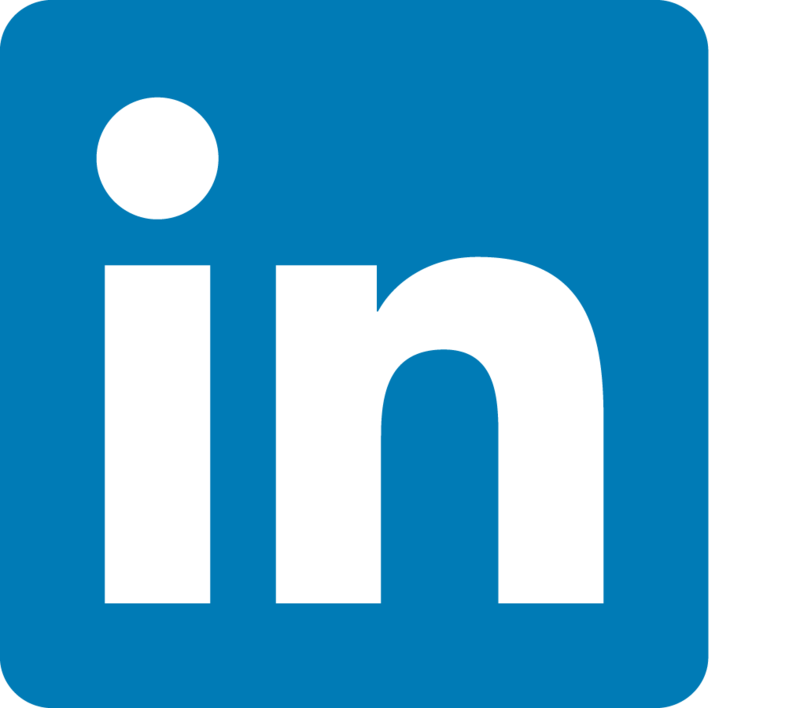 During the trial period there would also be a formal consultation period in early 2016 which would seek the views of residents, local groups, institutions, businesses and statutory groups to help inform a decision on whether the changes should be made permanent. If there is support for the changes, then Camden could consider making the traffic arrangements permanent and look to make further improvements including wider pavements and improved pedestrian crossings. However, residents on the western side of Tottenham Court Road are also concerned about increase traffic in Charlotte Street and other streets because of Camden’ West End Project. Camden has yet to announce any plans to address these concerns. On 1 June 2015 the High court of Justice refused an application for judicial review brought by the Licensed Taxi Drivers Association (LTDA) against Camden Council. The LTDA had argued that Camden had not followed proper process before coming to a decision on the West End Project transport changes. The High Court will however reconsider its decision at a hearing in open court on 1 July 2015 after a request by the LTDA. 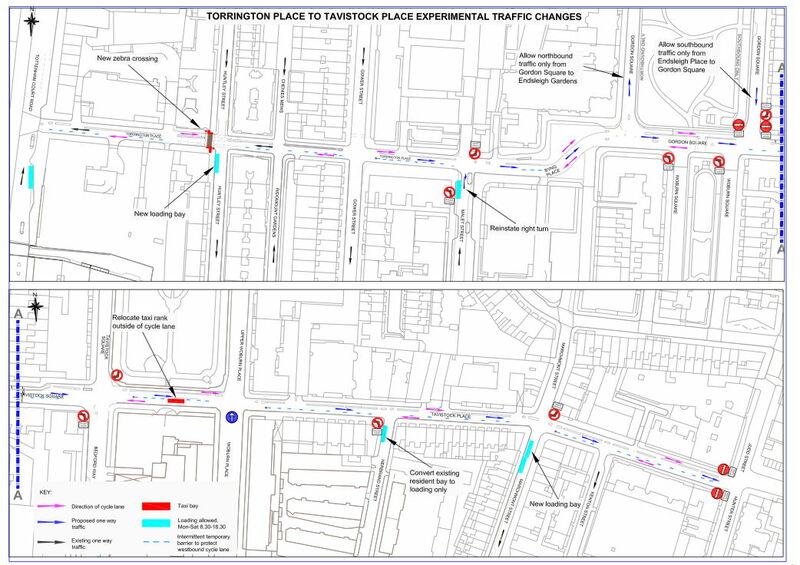 Report: Torrington Place to Tavistock Place Experimental Traffic Changes.